Neighbourhood Characters > Neighbourhood Character. Great piece by Joe Mathews for Zocalo. Good piece from Fast Company on the scourge of open offices. Russians Hacked My First Year Studio Project! Above: a concept for a prefab park house I designed in Studio during my first year at UBC. Original, right? 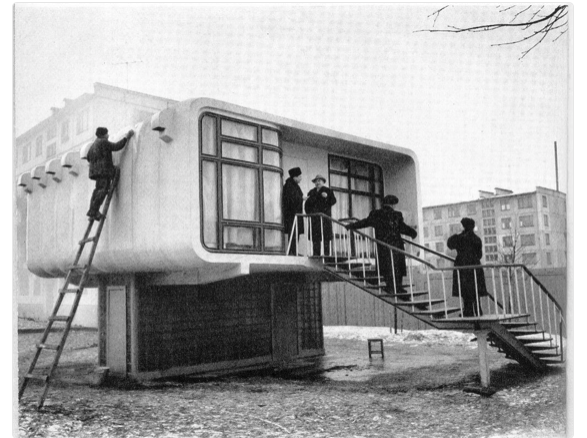 Below: an experimental house from Leningrad made many decades before. There's probably a moral here, but for now I'm pretty upset about time traveling Russian design thieves. 42four is on Apple Music. Right now we're releasing playlists one at a time, but coming this fall. when the social networking features of Apple Music kick in, we'll be engaging with the community more fully. Music is important to what we do over here. 42four HQ is rarely without a soundtrack, so we've decided to share our favourite playlists. Up first is Jazz. We made this playlist with people who are new to Jazz and need a place to start. 35 songs and growing this playlist will be updated from time to time and those updates should appear automatically in your music when you subscribe. Clich here for the playlist. 2015 was a hell of a year for 42four – great clients, great projects and great promise for 2016. The best to all of you this Holiday season. Cheers.